I understand that people are skeptical when trying new foods, new meats, or just trying vegetarian for the first time. 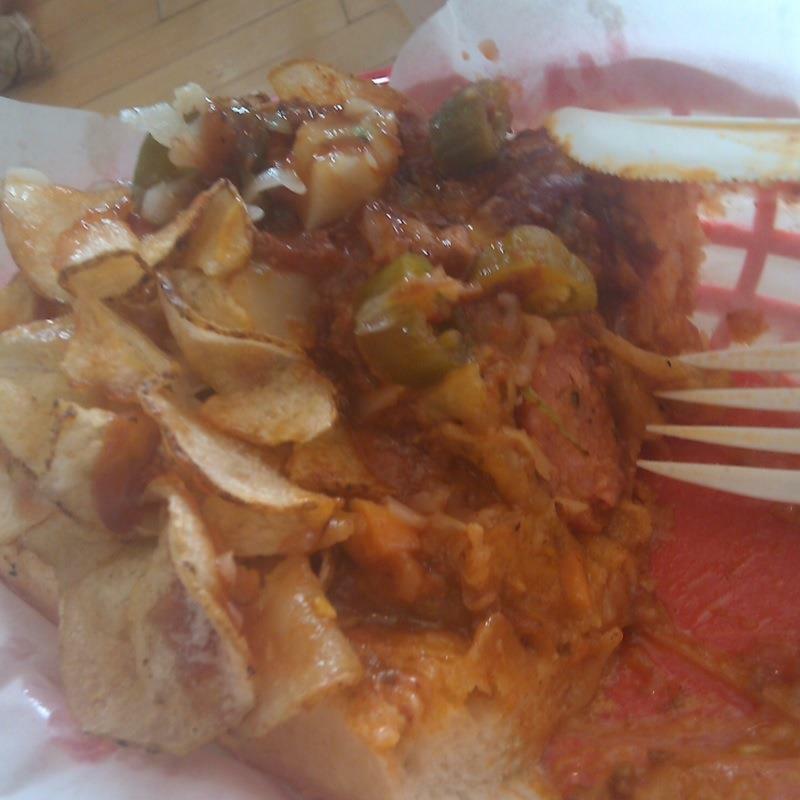 If you are one of those people, come to Chicago's Dog House and get one of their unique hot dogs... like Alligator. A different meat in a totally classic meal... a great way to be adventurous without stepping too much out of your comfort zone! Though interesting... I wouldn't be back for the speciality dogs all the time.. I can't rate it too high or too low since I haven't had other items on the list so Ill go ahead and give it a fairly neutral rating. Just be careful on what you choose and hope there is enough seating for your friends. Alligator corn dog served on a French roll with fried potato chips, bacon, chili, cheese, and gardinera.... It's half eaten before I remembered to take a picture... This was one of the messiest hot dog creations I have ever tried. If you actually want to taste anything I wouldn't suggest getting this hot dog because you could have put a normal hot dog instead of alligator and I wouldn't know the difference. Also, the chips make the entire meal very greasy so watch out. Simple laid back restaurant... Kind of hard to mess up ordering. Be sure though to ask about this menu item because when I went, it was UNLISTED.